A 1960 Ferrari 250 GT SWB Berlinetta Competizione is the top car on offer at the RM Sotheby’s Ferrari 2017 auction in Maranello / Modena, Italy. RM Sotheby’s will offer 41 Ferraris in the single-marque Leggenda e Passione – Legends and Passiion – sale in Modena, Italy in September 2017. 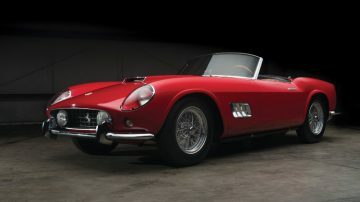 Three 250 GT cars are likely to achieve the highest results: a 1960 Ferrari 250 GT SWB Berlinetta Competizione, a 1959 Ferrari 250 GT LWB California Spider and a 1958 Ferrari 250 GT Cabriolet Series I. Half of the cars on offer is expected to sell for over a million dollar but the brand new 210th Ferrari LaFerrari Aperta that will be sold for charity is likely to generate the most interest. RM Sotheby’s and Ferrari will team up once again for a single marque sale on 9 September 2017 at Ferrari in Modena, Italy. 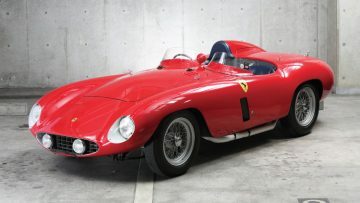 This Leggenda e Passione (Legends and Passion) auction follows on previous cooperation between RM and Ferrari that included the Maranello sale in 2008 where a 1961 Ferrari 250 GT SWB California Spider sold for $10.9 million – the first time ever a car sold for more than $10 million. 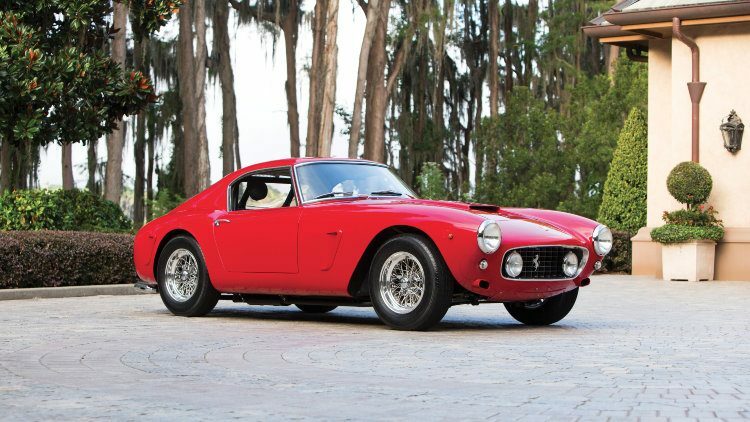 The auction will include 41 Ferraris and a dozen of automobilia lots. The cars are all top range but unfortunately does not include any absolute showstoppers such as a 250 GTO or important race winners. The 1960 Ferrari 250 GT SWB Berlinetta Competizione by Scaglietti, chassis 2163 GT, estimate €8.500.000 – €10.000.000, is the only car on offer at the RM Sotheby’s Ferrari 2017 sale in Maranello with the potential to sell for more than $10 million. Gooding sold one at Pebble Beach 2016 for $13.5 million but several others failed to reach reserve margins at recent auctions. The 1960 Ferrari 250 GT SWB Berlinetta Competizione is one of 46 alloy-bodied examples built in 1960 and was the 39th of 74 competition SWBs and 45th of a total 165 SWB cars built. This car was not raced in period leaving its chassis and body in very good original condition but the engine is a correct replacement fitted during the 1970s. The second most-expensive car at the RM Sotheby’s Ferrari 2017 sale is likely to be the 1959 Ferrari 250 GT LWB California Spider by Scaglietti, chassis 1503 GT, with an estimate of €7.500.000 – €9.500.000, which is near what was achieved by the model at auctions in recent years. A rare competition version could cost double. This 1959 Ferrari 250 GT LWB California Spider was the 35th of only 50 LWB California Spiders built and is a matching numbers example in a fully restored condition. It won 35 concours awards between 1988 and 1992 but was only shown at the XII Palm Beach Cavallino Classic in 2003 where it won a platinum award. 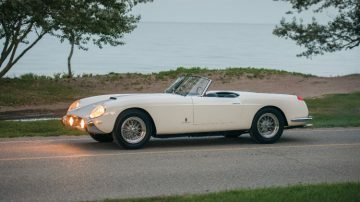 The 1958 Ferrari 250 GT Cabriolet Series I by Pinin Farina, chassis 0791 GT, estimate €4.700.000 – €5.500.000, was the 14th of 40 Series I cabriolets built with Pinin Farina coachwork. Originally, these cabriolets were more expensive than the Scaglietti-bodied California Spiders. The car on offer is in the correct white over blue but the engine is a period-correct rather than original engine. Gooding sold a similar car for just below $5 million at Pebble Beach 2017. The 1955 Ferrari 750 Monza by Scaglietti, chassis 0534 M, estimate €3.400.000 – €3.800.000, is the most-expensive racing car on offer at the RM Sotheby’s Ferrari 2017 sale. The car was raced in period in Italy, Cuba and Venezuela with its most significant result first in class at the Premio Ciudad Ojeda in 1959. As an active racing car, the vehicle was changed and developed and not as it left the factory. It has its original gearbox but the engine is a period-replacement rebuilt unit. The car participated in the Mille Miglia Storica four times in the last decade. 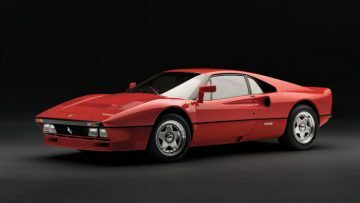 The 1985 Ferrari 288 GTO, estimate €3,250,000 to €4,000,000, is one of only 272 cars built of only the second Ferrari model to wear the GTO moniker. Ferrari 288 GTO prices have been hard to predict at recent auctions – some very strong results were achieved but the sole 288 GTO on offer during Monterey week 2017 attracted hardly any bidding despite a lower estimate of only $1.8 million. The 1985 Ferrari 288 GTO on offer at the RM Sotheby’s Ferrari 2017 sale should be helped by its excellent original condition. It has covered only 729 km from new and had the same owner since 1993. Describing the car as one of only 19 “lightweight” examples that were ordered without radio or power windows may be pushing it a bit. The most-expensive new car in the sale will be the 210th 2017 Ferrari LaFerrari Aperta that Ferrari will sell for charity. 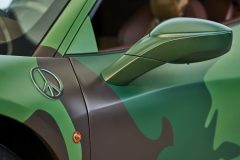 It will sport a unique color scheme that will only be revealed at the sale. The estimate of €3.000.000 – €4.000.000 looks somewhat unambitious: in 2016 RM Sotheby’s sold the 500th LaFerrari in a charity sale for $7 million and at Monterey 2017 a low-mileage standard LaFerrari at Mecum attracted an unsuccessful $4 million bid. 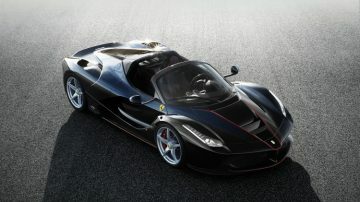 A late entry to the auction is the original 2013 Ferrari LaFerrari Prototype (estimate €1,100,000 – €1,300,000). This is a running model but not street legal. Ferrari 365 GTB/4 Daytona Berlinettas only rarely achieve results in excess of a million dollars but the 1969 Ferrari 365 GTB/4 Daytona Berlinetta Alloy by Scaglietti, estimate €1.400.000 – €1.700.000, that will be on offer without reserve at the RM Sotheby’s Ferrari 2017 sale is one of the rare cars with such million-dollar potential. This 1969 Ferrari 365 GTB/4 Daytona Berlinetta Alloy, chassis 12653, is considered to be the only road-going alloy 365 GTB/4 Daytona in existence – five others were made for competition. 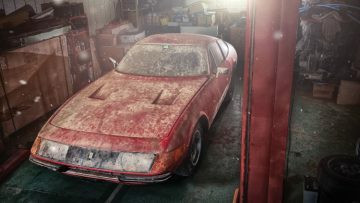 This car has been in Japan since 1971 and has been hidden for the past four decades – parked near a building site judged by the amount of dirt on the vehicle. It is in a complete and highly original condition but like a barn find will require a comprehensive restoration that will add considerably more than just auction premium to the hammer price. The oldest car in the RM Sotheby’s Ferrari 2017 sale is the 1950 Ferrari 195 Inter Coupé by Touring, estimate €1.100.000 – €1.500.000. This car was the first of only 25 produced on the 195 chassis and one of only three fitted with Touring coachwork. 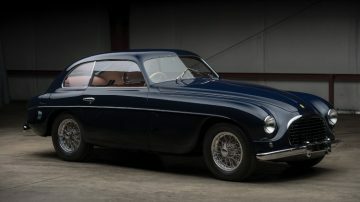 The car is fully restored and was shown at the Pebble Beach Concours d’Elegance in 2008, was awarded a Platinum award at the 2009 Cavallino Classic and was then shown at The Quail in 2010. 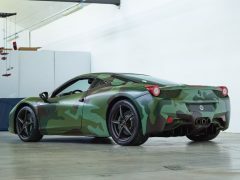 A rather unique 2010 Ferrari 458 Italia, estimate €250.000 – €350.000, will be offered without reserve. 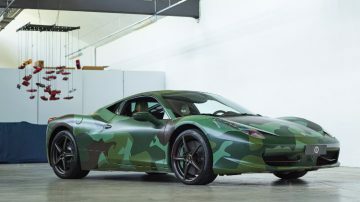 This custom camouflage paint design 458 Italia was produced by Ferrari’s Tailor Made department for Lapo Elkann, Fiat heir and grandson of Gianni Agnelli. 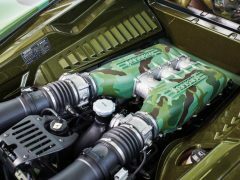 He had the camouflage theme extended to the engine bay and interior of the car. Peace signs replaced prancing horses on the front wings. Lapo Elkann retained the car until it was sold for €1 million in a charity sale at the amfAR Cinema Against AIDS Gala dinner during the Cannes Film Festival in 2016. 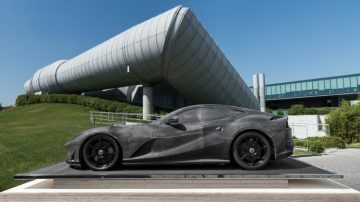 Another interesting lot is the Ferrari 812 Superfast Wind Tunnel Model, Scale 1:2, estimate €280.000 – €320.000. It may sell for more than some of the cheaper Ferraris in the sale. This half-size model is made mostly of carbon fibre and was used in the wind tunnel to improve downforce without adding unnecessary drag. It weights around 200 kg.